The District line used to run to Southend-on-Sea. No really. From 1910 to 1939 there were seaside specials pulled by steam locomotives, fast from Barking to Leigh-on-Sea, maybe three times a day. Some of them even went to Shoeburyness, but I didn't fancy going there again. Instead I stopped off in Southend to take a ride on a completely different railway, down the longest pleasure pier in the world. 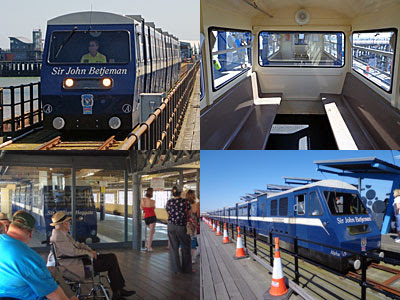 Sir John Betjeman once said that "the Pier is Southend, Southend is the Pier", which is convenient, because almost every tourist article written since has started with these words. The pier owes its existence to something the Southend Tourist Board would rather not mention, which is mud. The Thames is wide and tidal (and sand-free) at this point down the estuary, and the mudflats go out a very long way. Arrive at high tide and you might not guess, but at low tide the sea goes out at least a mile, so a very long pier was required to allow pleasureboats to dock. The first wooden pier opened in 1830, was extended in 1848 and was replaced by iron in 1889. It proved extremely popular with tourists, and with the navy during World War II. More recent years have not been so kind. The pavilion at the far end burnt down in 1959, and another fire destroyed much of the pierhead in 1976. Ten years later a tanker smashed into the pier creating a 70 foot gap, and another fire in 1995 destroyed the bowling alley. Most recently in 2005 the station at the estuary end burnt down, leaving charred wood and twisted rails. Thankfully the pier's structure has been rebuilt each time, not least because access is required for the lifeboat station on the tip, and a new Cultural Centre opened at the far end last summer. Before venturing onto Southend Pier you need to decide how much you're going to pay. To ride to the end and back on the railway costs £4, to walk £2, whereas walking down and getting the train back (or vice versa) costs £3.50. I did what most visitors do and took the train from the Information Centre on the riverside. The station is a gloomy space beneath the boardwalk, with too few places to sit and a glass screen in front of the platform. There's no sign of a timetable, not unless you asked the lady who sold your ticket, you just hang around for up to 30 minutes (or 15 minutes at peak times) for the next service to leave. And then you bundle aboard, in a polite and dignified way (unless there's a family wanting a carriage to themselves, in which case it's every Essex holidaymaker for themselves). The carriages aren't lovely, to be honest, a bit like two seaside shelters bolted together, but comfortable enough, and suitably weatherproof. I shared mine with two dear ladies who didn't seem too chuffed to have last-minute accompaniment, but then I guess I'd have preferred my trip if they'd not been there either. And the train's called the Sir John Betjeman, delightfully, for obvious reasons, unless you get the other train which is named after Billy Butlin. The journey out into the estuary takes longer than you'd think, almost ten minutes. There you are in a train heading offshore, at not unreasonable speed, and you keep thinking surely there can't be much further to go. The windows face out so you can't see the end of the pier, only the sea. Or maybe the mud, depending on whether the tide's in or out. I visited sometime inbetween, creating the splendid effect of shallow ripples lapping over swirly seaweed. About halfway out, near the passing loop, is an extensive mudbank that survives the rising of the waves longer than most. I was surprised to see two people wading out into the water, far from the shore, aiming for this 'high ground'. They were thigh deep, and my first thoughts were of wilful negligence, but it swiftly became apparent they were local enough to know precisely what they were doing. Onward the train rolled, and not there yet, and surely soon, and eventually yes. The end of the pier comes in several stages. First the station platform, with a pleasantly modern glass shelter beneath a segmented canopy - a recent addition. Then a homely cafe, because Southend isn't your typical candy floss and donuts seaside pier. Then some toilets, which are more souped-up portakabins, but needs must. And then there's a larger expanse at the far end, where the grand glass pavilion would once have stood. Its 2012 replacement is The Royal Pavilion, a large steel box with jaunty slopes - part cafe, part performance space. The plan must have been for food and drink to rule by day, then for audiences of up to 200 to enjoy something arty in the evening. And the cafe's doing fine, but the list of confirmed events in the pavilion looks rather sparse (as any economist would have warned had you said you were building an arts centre more than a mile out to sea). At the very end of the pier, dog-legged left, is the two-storey lifeboat station with its rather taller lookout tower. The RNLI are more than pleased to welcome visitors, especially to their shop (Christmas cards now available) which doubles up as a minor museum. Or head upstairs to the final boardwalk, where benches, masts and a medium-sized bell mark the last outpost before Kent. That's the Isle of Grain over there, where Boris wants to build an airport, and the coast past Sheerness stretching off towards Whitstable. A steady stream of container ships floats inbetween, if the tide's right, keeping to carefully charted channels as they pass. There are better views to be had at the British seaside, to be frank, but I love the openness and expansive skies of this midriver panorama. I walked back, partly for variety, partly for the sense of achievement, but mostly because the queues for the train were quite long. I passed grizzled anglers, and determined mums with pushchairs, and Sir John rattled past me at least twice. Again it's further than you think, a full one and a third miles to reach the seafront, which gradually enlarges from thin strip to full-on rollercoaster & chips as you approach. 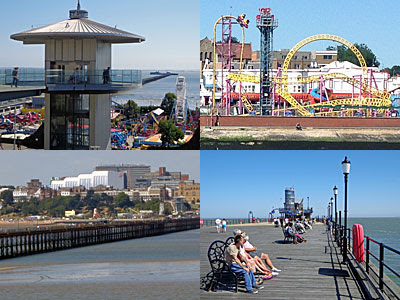 The pier may be less alluring in February, but in high summer Southend's finest attraction is undoubtedly offshore.